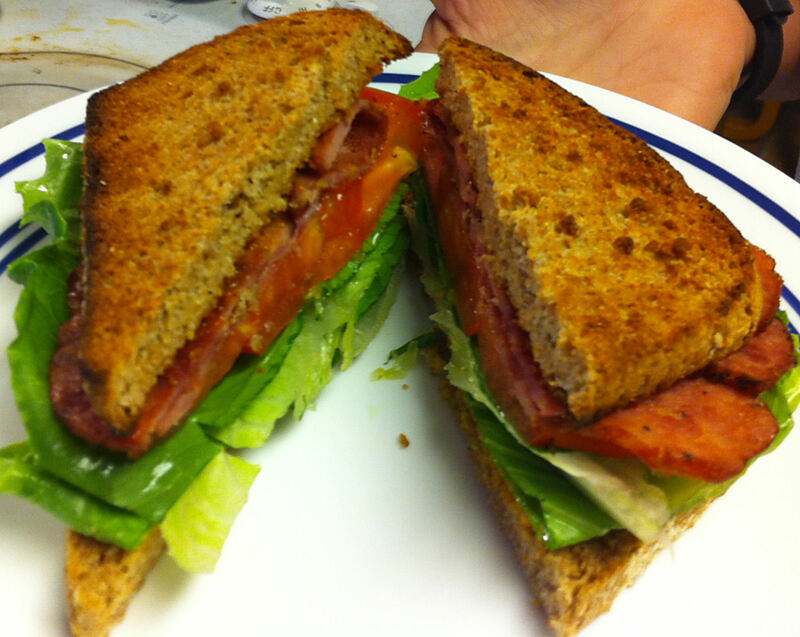 Jan likes the idea of BLTs—bacon, lettuce, and tomato sandwiches—but she has an aversion to bacon. Yesterday, she asked me to make her one using turkey bacon. Eilene and I do not dislike bacon, so I made her a more standard version. For myself, I just had to add a twist with some pickled artichoke hearts. 1. Fry the bacon until crispy. Note: Jan prefers the denser whole wheat bread and I prefer the lighter crumb of whole wheat French bread. 2. Spread one slice of toast with the mayonnaise and the other with the spicy mayonnaise. 3. Slice the tomato into ¼ to ⅓ inch thick slices. 4. Rinse and dry the lettuce. Tip: Crush or cut out the large central rib. 5. Lay the lettuce on one slice of the bread. 6. 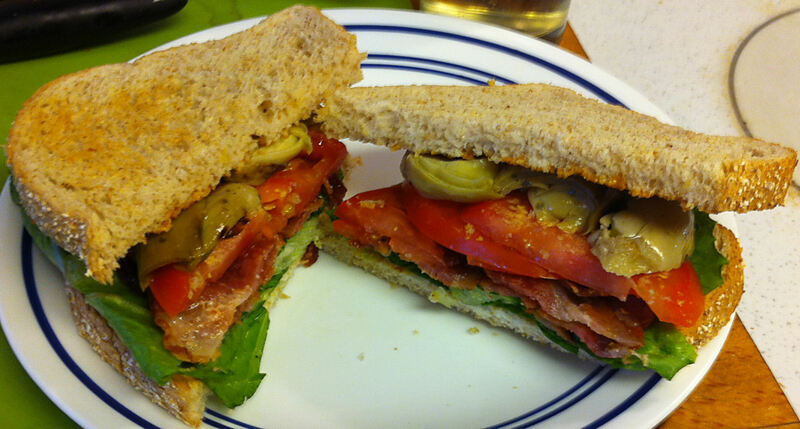 Top with the lettuce with the tomato and the tomato with the bacon. Note: For the artichoke BLT. Slice the artichoke and top the bacon with the slices. 7. Top the sandwich with the second slice of toast and cut on the diagonal. Tip: Eilene like to peg the halves with toothpicks to stabilize the stacks.